Become an NCGA Volunteer and help shape the future of golf! The NCGA’s more than 300 volunteers form the backbone of the Association. Tournament officials and course raters carry out the essential activities of the NCGA, ranging from the administration of the many championships to the assigning of course rating and slope information to each course in the region. Tournament officials are responsible for conducting all NCGA tournaments, functioning as rules officials and monitoring the pace of play to ensure a first-rate experience for the competitors. A rules certification program is available for volunteers seeking advanced training. Course raters operate in teams of 8-14 and in a two-to-three hour process, evaluate the obstacles encountered on a course that impact scoring such as topography, rough and recoverability and green target. The course being rated is also played to confirm the numbers assigned. 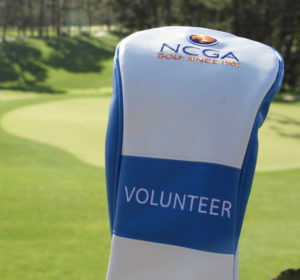 Volunteers receive many benefits through their involvement with the NCGA ranging from free golf (sometimes at Spyglass Hill), free uniforms as well as a 30% discount in the Poppy Hills and Poppy Ridge golf shops. Tournament officials also provide valuable service to some of the highest profile events in region such as the AT&T Pebble Beach National Pro AM, the Charles Schwab Cup, The First Tee Open at Pebble Beach and the California State Amateur. If you are interested in the Rules of Golf and assisting in tournament administration, download the application and return the completed form to Ryan Dunham, Assistant Director of Rules and Competitions. Application Deadlines: October 1-June 30, confirmed tournament officials will start service in the Fall. July 1-September 30, confirmed tournament officials will start service in the Spring. An experienced tournament official will interview you in the near future. You will then be asked to attend one day of a tournament conducted by the NCGA where you will meet with an NCGA Staff member or a member of the Board of Directors and experience a typical tournament day. This will give you the opportunity to have your questions answered regarding our programs. While the Association is actively seeking more tournament officials, the path to becoming a course rater has a waiting list. Contact NCGA Assistant Director of Course Rating Jeremy Gray for more information on the current wait list and process in becoming a course rater. Thank you for your interest in becoming an NCGA volunteer. You will find that this is an exceptional group of people. Each year, the NCGA recognizes its top Tournament Officials and Course Raters from the previous season. The NCGA thanks all of its volunteers for their service. Without you, it doesn’t happen!